You can find this super nice 2017 Chevrolet Cruze LT and many others like it at Karl Chevrolet. This Cruze LT was sold new and serviced right here at Karl Chevrolet so we know it has been well cared for. Great looking in Tungsten Metallic with Medium Atmosphere Cloth Interior, this LT model features Keyless Start, Remote Start, Rearview Camera, Heated Seats, Power Drivers Seat, Alloy Wheels, Bluetooth and much more! This Chevrolet includes: ENGINE, 1.4L TURBO DOHC 4-CYLINDER DI 4 Cylinder Engine Gasoline Fuel Turbocharged CONVENIENCE PACKAGE Keyless Start Remote Engine Start Power Driver Seat Heated Front Seat(s) WHEELS, 16" Aluminum Wheels SEATS, HEATED DRIVER AND FRONT PASSENGER Heated Front Seat(s) SEATS, FRONT BUCKET WITH RECLINING SEATBACKS AND ADJUSTABLE HEAD RESTRAINTS (STD) Bucket Seats SEAT ADJUSTER, DRIVER 8-WAY POWER Power Driver Seat KEYLESS START Keyless Start TRANSMISSION, 6-SPEED AUTOMATIC (STD) A/T 6-Speed A/T TIRES, 205/55R16 ALL-SEASON, BLACKWALL (STD) Tires - Front Performance Tires - Rear Performance KEYLESS OPEN Power Door Locks Keyless Entry AUDIO SYSTEM, CHEVROLET MYLINK RADIO WITH 7" DIAGONAL COLOR TOUCH-SCREEN AM/FM Smart Device Integration AM/FM Stereo Bluetooth Connection REMOTE VEHICLE STARTER SYSTEM Remote Engine Start LT PREFERRED EQUIPMENT GROUP DARK ATMOSPHERE/MEDIUM ATMOSPHERE, CLOTH SEAT TRIM Cloth Seats LPO, CARGO NET EMISSIONS, CONNECTICUT, DELAWARE, MAINE, MARYLAND, MASSACHUSETTS, NEW JERSEY, NEW YORK, OREGON, PENNSYLVANIA, RHODE ISLAND, VERMONT AND WASHINGTON STATE REQUIREMENTS TUNGSTEN METALLIC *Note - For third party subscriptions or services, please contact the dealer for more information. * Only the CARFAX Buyback Guarantee can offer you the comfort of knowing you made the right purchase. With its full CARFAX one-owner history report, you'll know exactly what you are getting with this well-kept Chevrolet Cruze. You know exactly what you are getting when you purchase a Certified Pre-Owned like this Chevrolet Cruze. Clean interior? How about flawless. This Chevrolet Cruze looks like has never been used. More information about the 2017 Chevrolet Cruze: The Chevrolet Cruze is a compact sedan competing with the Ford Focus, the Honda Civic, and the Toyota Corolla, among others. It's a crowded segment, and any car looking to stand out needs to bring its A game. The Cruze does just that, with a class-leading wheelbase to improve interior room and a bevy of available features, including upmarket luxury items like heated seats. A new generation of MyLink smartphone integration is also standard, displaying through a seven-inch color screen mounted on the dashboard. 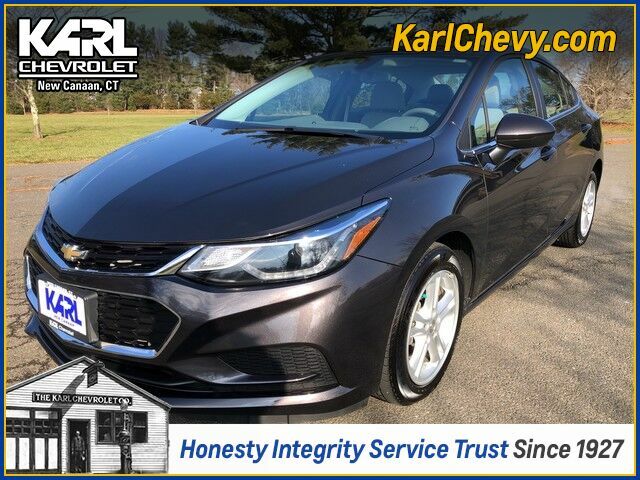 Interesting features of this model are available high-end features, Lots of standard amenities, efficient turbocharged engine, roomy for a compact, and good smartphone integration As always, our goal here at KARL Chevrolet is to assist you to find the perfect vehicle to meet your needs. While we strive to have the area's best selection of quality pre-owned vehicles in stock at all times, we know there are times when a customer may have very specific needs. If you have a specific model or features that you are searching for, please let us know. You might be surprised at how quickly we can find a match! Just another KARL Advantage .... finding you the perfect vehicle at the best overall value. Thank you for the opportunity to assist in your vehicle search.